Did Your Sexual Chocolate go bad? 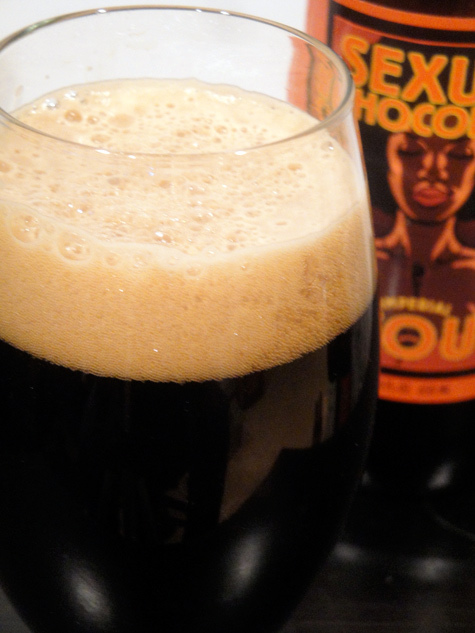 Been hearing a lot of chatter on twitter whether or not this years foothills Brewing’s Sexual Chocolate had some issues. Since I was lucky enough to have a friend with an extra bottle a couple months ago, I decided to see if my bottle was a victim to internet rumors. I can’t say that I’ve ever had this beer before, but my guess it isn’t supposed to smell like the New Glarus Old English Porter. However with that said, I think it smells pretty friggin’ good. Even if it is not the way it was intended, sometimes happy accidents can be beneficial. My beer has started to sour somewhat; there was a serious infected flavor to the beer. Now before people starting saying, “Aww Man you must have had to dump it”, I didn’t. You see some times bad things happen to good beers; in even rarer cases the bad things can actually be enjoyable. As many of you know, I choose not to write negative beer reviews. It’s not my style or what I want people to read on Simply Beer. However, even while this beer was not what it was supposed to be, I rather enjoyed the dry tartness; almost sour, mixed with a strong bitter chocolate flavor. I’ve read some unfavorable tweets about this beer going bad. My beer wasn’t bad, I don’t think it is what was intended, but not bad. It was simply different. So, would you have given this beer a chance? Last year Cigar City had an issue with a number of bottles of their Bolita Brown getting an infection due to brett still being in the bottling lines. CCB offered refunds to anyone with a bottle and promised to make something super sour out of it. I decided to keep it and a few months later opened it and we really enjoyed it. It turned into a nice sour brown ale. Fast forward to a couple months ago and CCB released Sea Bass. It was the product of the bad bottles brought back and the use of St. Somewhere’s yeast strain. And that beer is amazing. So as you said sometimes mistakes can be enjoyable. that’s pretty cool, Mike! Love CCB, hope they get to keep their tasting room open. Previous story 3 Months 10 Beers – Patersbier – If He Had the PERFECT Beer Why Didn’t He Share?? ?